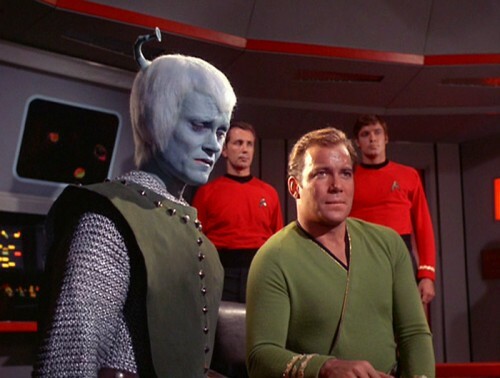 This is my second-favorite TOS episode (after “Amok Time”), and I think it’s brilliant on so many levels. The scene in Spock’s quarters, where Amanda slaps him — god, Spock’s courage gets me every time. Regardless of whether you think he’s making the right decision there, one has to appreciate that this decision is COSTING him, big time, but he will do what he thinks is the right thing, regardless of how much it breaks his heart, because that’s who Spock is. He’s a man and a half, and that scene simultaneously breaks my heart and gives me so much respect for Spock. 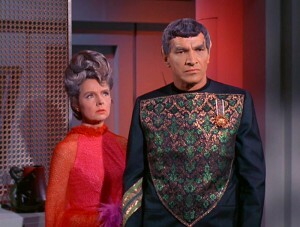 As for the “my wife, attend” thing, my reading is that Sarek is the Ambassador, and he’s WORKING during this trip. He may treat her very differently in private, but in public, she needs to be his back-up and support person, because THEY aren’t the Ambassador, HE is the Ambassador. One thing I think people are overlooking when they talk about the many subplots is that this episode wasn’t written to be seen on DVD; it was written to be shown on TV. There needed to be a major plot twist or a major new jeopardy right before every commercial break, to keep viewers tuned to that station. Nielsen ratings were taken every fifteen minutes, and having people turn away from your show partway through was the way to get cancelled. So Dorothy Fontana wrote an episode that had a big new reveal or a big new threat before every commercial break, and I think she did it brilliantly.